The Church confesses that Jesus Christ is its hope and is itself a community of hope. This study introduces us to the basics of Christian hopein Christ, God is making a new creation, a new beginning for human life and for all things. We live on the strength of that promised new creation. Through biblical and theological insights, David H. Jensen explores the hope that is within us, the hope that does not disappoint us, and the hope we can rejoice in. 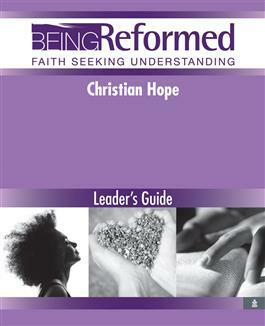 Being Reformed: Faith Seeking Understanding is a series of biblically based studies that provides adults with a foundational understanding of the Reformed faith. Each six-session study is written by well-known and respected scholars and features Scripture, prayer, in-depth commentary, and questions for reflection. Each study addresses its subject from a Reformed theological perspective.